Check in time for the Penobscot is 8:00 AM. Regular Penobscot trips eat on the river and return by 3 to 4:00pm with the day’s activities complete by 6:00pm. We will provide you with a paddle, life jacket, and helmet – helmets are required on the Penobscot. Wetsuits are required on some early and late season trips and other times based on weather conditions; our staff will recommend what is appropriate. If at the end of the day you feel that some or all of your wetsuit was not needed, we will refund the rental fee. This is Maine whitewater rafting after all, and conditions can be highly variable! For personal clothing on the river we recommend a bathing suit or shorts, sneakers or river sandals. Wool socks and polypropylene long underwear or fleece add comfort on cool days. (Do not bring cotton to wear on the river as it does not dry and you will be cold.) NEOC has plenty of cool weather rental wet suits, booties and spray tops to make you more comfortable and will advise you when you need them. At the base, leave a towel, a warm, dry change of clothes including socks, shoes and underwear for post-trip showering and changing. A detailed and entertaining safety orientation precedes all trips. Our river lunch includes choice of chicken, fish, steak or a vegetarian option with your selection made at trip check-in. On Penobscot trips we serve lunch riverside after the morning run. NEOC is a family resort and we welcome children. For their safety the minimum recommended ages are as follows:Penobscot River – 10 yrs on the lower half; 15 yrs for the Upper river (upper and lower). 10 yrs and up for the Penobscot Soft Adventure river trip and family float is 4 years young. Our guides are professionals and work hard to give you an experience you won’t soon forget. The price of all guided activities and instructional sessions does not include a gratuity; however, they are greatly appreciated and appropriate when exceptional service is provided. Sunscreen. We recommend at least SPF 30 and make sure it’s waterproof! Sunglasses. While you might not want to bring your favorite and most expensive pair (in case they end up in the water), you will want protection for your eyes. The sun off the water can produce quite a glare. Attaching “Croakies” or a string to your sunglasses is also a good idea. Water bottle. With the excitement and activity, you are bound to break a sweat, so be sure to stay hydrated during the trip. Wet suit or paddling jacket. These items are suggested for when the weather begins to turn and it gets cold. Water shoes. Your feet are going to get wet. 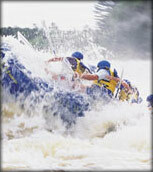 Guests should enter the raft with shoes or sandals that can get wet and will stay on your feet. We recommend rubber soled water shoes or sandals with Velcro. Camera. If you’re interested in capturing the moments of your Maine whitewater rafting trip on camera, be sure you bring your waterproof camera. A good attitude. Whitewater rafting takes a group effort from everyone in the raft and you will be an important part of a successful trip. Your attitude and willingness to be part of a team will be important to making sure everyone enjoys their experience. If you have any questions about any of the items on the list or any questions about whitewater rafting in Maine, please give us a call. We are always ready to help. Call us at 1-800-634-7238 or e-mail [email protected]. New England Outdoor Center reserves the right to cancel trips, switch rivers, and change itineraries due to weather, water flow, and our professional discretion. Please know that we will communicate these changes to the best of our ability to ensure our customers can prepare appropriately. 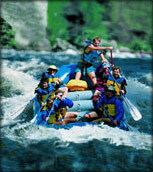 We have been rafting for 30 years and have rafted almost every single day as scheduled! We require a deposit of 50% of the total reservation within 10 days of the date the reservation is made. We can either take a credit card payment at the time of the reservation or we will send you a copy of your reservation and expect payment within 10 days. We can also take deposit payments individually from more than one person in a group and apply and itemize that payment toward the reservation. All reservations must be paid in full 45 days prior to the trip date. NOTICE: All reservations for which no deposit is received 45 days in advance may be automatically cancelled without further notice to you. For reservations made within 45 days of the trip date we require full payment when the reservation is made. All reservations confirmed with a deposit will receive our full confirmation literature. 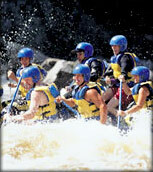 Rafting, snowmobile rentals and our cabins are in high demand and we enforce a strict cancellation policy. If we receive cancellation 45 or more days prior to the trip date, a full refund will be granted. Cancellations made within 45 days of the trip date are non-refundable. Cancellation Fee: $25 per person of your deposit is non-refundable and non-assignable. Security Deposits are required for each accommodation and will be collected at the time of check-in. If we discover any damage or missing items, we will prepare a written estimate which will be forwarded to you and your credit card on file will be charged the full amount of the repair or replacement costs. PLEASE note all accommodations are non-smoking. If we find that your accommodation(s) has been smoked in, an additional $200 per unit charge will be applied to your credit card on file. ON RISK: Although we have an excellent safety record, our trips and activities are not without risk. It should be recognized that accidents can and do occur. 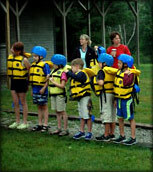 All adventure participants must sign an Assumption of Risk and Agreement to Participate form, before participating in any activity with New England Outdoor Center. We reserve the right to switch rivers or rental locations if water, snow or weather conditions merit a change. All of our activities run rain, snow, or shine. Finally, a few rules: Alcohol consumption is prohibited prior to and during trips, and quiet hours at 10PM are enforced to assure all our guests’ satisfaction. Must be on a leash at all times. You must pick-up after your dog. You may not leave your dog unattended unless in a kennel due to barking, damage and summer heat. We may be able to arrange for dog sitting, just stop by the office at Twin Pines for details. Please keep cabins picked up and clean if your dog swims etc. No dogs allowed on beds and furniture. You will be charged for any damage or extra cleaning. NEOC reserves the right to change or update prices at anytime, without notice. Once you have booked, your booked price stands even if prices go up.